In order to do something about my obsessive-compulsive disorder or OCD, I have recently read a book titled “Overcoming obsessive-compulsive disorder – A self-help guide using Cognitive Behavioral Techniques”, written by David Veale and Rob Willson, and published in 2005. The book uses Cognitive Behavioral Therapy (CBT) techniques and the authors are both skilled CBT practitioners: David Veale is a Consultant Psychiatrist in CBT, and Rob Willson is a CBT therapist. According to the book, CBT is the only one specific type of psychological therapy that has been shown to help for OCD. 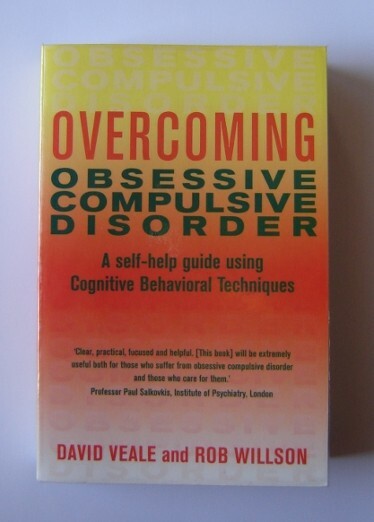 In short, techniques in this book focus on “exposure and response prevention” treatment, which means that OCD sufferer would deliberately expose himself to things that cause him anxiety and then resist from doing the compulsion. For example, if someone with OCD were afraid of germs, then he would deliberately touch something that he considers contaminated (e.g. money, floor…) and then refuse to wash his hands for as long as possible, even though his anxiety would greatly increase because of this. After some time, this anxiety would decrease naturally, even though the compulsion or ritual was not performed. After each successive exposure, the anxiety will be less intensive and rituals will eventually become unnecessary. Exposure and response prevention, however, is only one part of CBT. The other, “cognitive”, part basically involves the process of building alternative explanation of a person’s intrusive thoughts, doubts, images and impulses (Theory A versus Theory B). In short it can be described as reframing your thoughts. For example, a patient with obsession with order and symmetry might believe, that there is a problem with chaos and disorder that he has to prevent in order to be able to cope with life (Theory A). The reframed Theory B might explain to him that he has a problem with being afraid of chaos and disorder, and actually this fear makes him unable to cope with his life, not chaos and disorder. The theory is simple, but its applications are not. The authors are aware of many traps that wait on the road to recovery from OCD and want to give the reader a good understanding about every common problem that he may encounter when dealing with OCD. The book is divided into two parts: in part one, authors discuss the nature of OCD and its possible causes; part two deals with how to overcome this disease. First, the principles of CBT for overcoming OCD are explained, followed by many real life examples of people with different variations of OCD and how they used CBT to get better. After that, the reader learns how to set appropriate goals and how to manage obstacles and problems to overcoming his OCD, as well as advice on how to prevent a relapse of disease. One chapter is dedicated to children and adolescents with OCD, and the book ends with discussing what can family and friends do to help. Appendices amount for almost one quarter of the volume and cover the following: medication for OCD and their side effects; what to look for when searching for professional help; list of support groups, charities and other resources for OCD; self-assessment forms; and progress charts. It is worth noting that the authors prefer CBT as the initial treatment and only recommend medication as an additional treatment for those who fail to make progress with CBT, whose OCD is more severe, or who are also significantly depressed. I found the book easy to grasp and it gave me a solid understanding of CBT principles – at least for dealing with OCD. Within the book there are a lot of references to other pages, chapters and appendices, so that the authors didn’t have to repeat themselves (the book already has 451 pages altogether) and to help the reader navigate (e.g. see Appendix 1). Because of this I would recommend that you read this book at least twice, as when you first read it you don’t have the whole picture and references don’t mean much to you (or you have to jump around the pages all the time). But anyone serious about overcoming his OCD would read this book more than once anyway. On the negative side, there are some spelling and grammar mistakes throughout the book, and I even think that they didn’t correct them on purpose, as “perfectionism is a common feature of OCD in individuals with a desire for control and order”. More annoying is the fact that some references to other pages are wrong, for example it says “see page 96”, but when you go to that page, you can’t find the things that they are talking about there. However, maybe this is also done on purpose, in order to provide some additional exposure treatment to individuals as myself, who suffer from perfectionism. Overall this is a good book about CBT for overcoming OCD and I would recommend it to anyone interested in this subject. I haven’t read any other similar books, so I cannot judge if it is the best, but I would say that it is definitely worth reading.